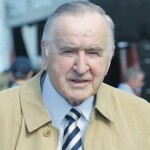 Albert Reynolds, served as Taoiseach of Ireland, serving two short terms, in office, in 1992 as head of a Fianna Fáil/Progressive Government coalition, and from January 1993 until 1994 at the head of a Fianna Fáil/Labour coalition. He has been nominated for the Nobel Peace Prize. He was the fifth leader of Fianna Fáil during the same period. Reynolds was first elected to Dáil Éireann as a TD for Longford–Westmeath in 1977, and was re-elected at each election until his retirement in 2002.